Continuous delivery for your Sketch plugins. Sketchpacks Relay is a Github Integration designed to help you quickly deliver plugin updates to your users. Whenever you make a change to an integrated repository, those changes will be automatically propagated to the Sketchpacks Registry. By utilizing the web-hooks provided by Github, Sketchpacks Relay can provide close to real time updates and notifications to your users via the Sketchpacks for macOS menu bar app! Serve those improvements and bug fixes to your users quicker than before. Automatically notify your users when new versions are available, via the Sketchpacks for macOS menu bar app. All your published plugin releases are made available to your users who want to install an exact version of your plugin. Focus on the important work while we handle serving your plugins and their updates. Your plugins in the registry will be kept up-to-date and serve your releases when you publish a new release on github, or push a commit to the master branch. Why do we need read access to your code? The only code that Sketchpacks Relay needs access to is your readme markdown and manifest json files. We cache this information to keep your plugin up-to-date in the registry and to improve overall API performance. We also use this access to detect if a repository is actually a Sketch plugin. Only repositories with a valid manifest.json will be indexed in the Sketchpacks Registry. For security reasons, private repositories are not indexed in the Sketchpacks Registry. This feature will be available in future releases, but the access control needed to make it work will take a little bit longer to hammer out. Stay tuned! 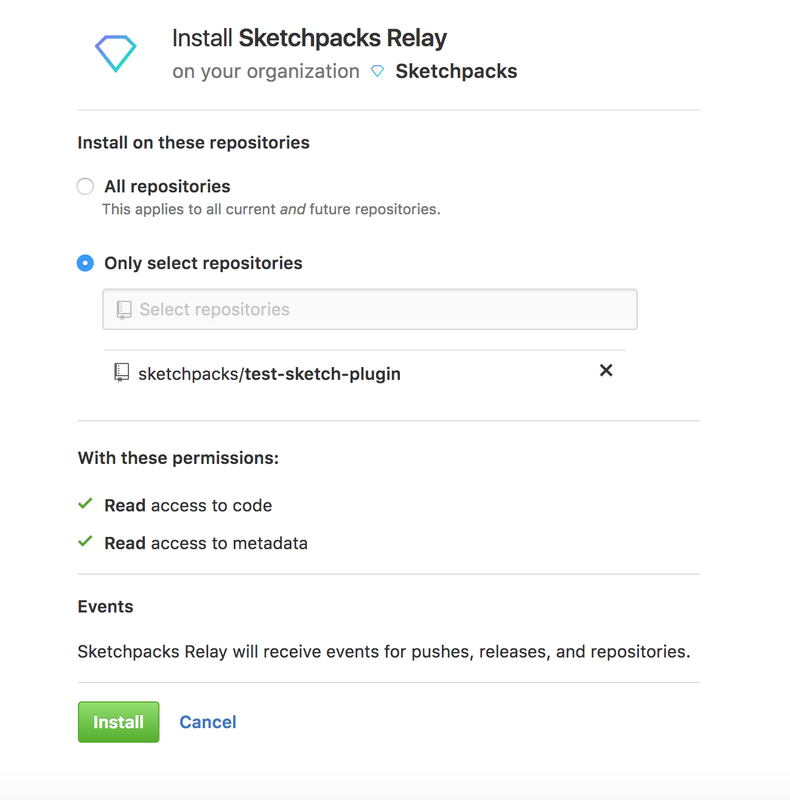 If you need to change which repositories Sketchpacks Relay has access to, go to your personal/organizations settings in Github and click the link to your installed integrations. This is also where you can go if you want to remove the Sketchpacks Relay installation from your Github account.